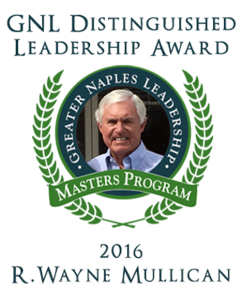 In recognition of his outstanding volunteer commitment, passion and leadership in several local nonprofit organizations, R. Wayne Mullican (Class IX) received the 2016 Distinguished Leadership Award on April 8 at the 20th Anniversary Gala. 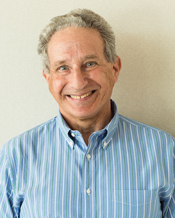 Most prominent is the work he has done with saving the Senior Friendship Health Center in Naples, an organization that was on the verge of closing in 2006. Staffed with volunteer doctors and dentists, it has since grown to a current 4,500 visits from older patients who have limited or no access to affordable and quality health and dental care. Moving from inadequate facilities in downtown Naples and a subsequent one in North Naples, the Friendship Health Center now operates in an expanded 6,000 sq. ft. facility on Airport-Pulling Road, near the County Government Center. 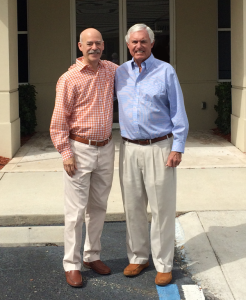 Wayne is vice chair of the Center’s Advisory Board, serves on the Governing Board for Florida’s five Friendship Centers and devotes countless hours to recruiting, raising funds, growing awareness and advocating of behalf of patients. He served for seven years on the NCH Hospital System’s Board of Trustees, including the Executive and Strategic Planning Committees during the development of NCH’s partnership with the Mayo Clinic. He is a mentor for a Golden Gate High School sophomore in the Champions for Learning’s Take Stock in Children Program and volunteers to help students complete their financial aid applications.